The Comedy News: Herman Cain: "Pizza is Defined As a Sacred Bond Between Sauce and Cheese"
OMAHA, NE - (@TheComedyNews) - Republican Presidential candidate Herman Cain announced today that if he is elected President in 2012, he will push through Congress a law that defines pizza as a sacred bond between sauce and cheese. Cain is currently a contender for the Republican nomination for President in 2012. He has earned a living as chief executive officer of the Godfather's Pizza chain. "The long-standing debate over whether a "pizza" lacking both cheese and tomato sauce should be recognized as a pizza will be settled in this country," announced Cain at a press pizza party in Omaha. "If elected President, expect me to enact the Defense of Pizza Act within 100 days." The Defense of Pizza Act or "DOPA" will prevent the federal government from recognizing the validity of a pizza with anything more than traditional ingredients and toppings. Some Americans in the heartland are championing the proposed Defense of Pizza Act. "Those darn pizzas that don't have any sauce or cheese, they ain't no pizza. In fact, they're gay pizza," asserted Roger Barbero, owner of Roger's Pizza in Sandusky, Ohio. "I hate it when these new age nasty heathen, no-family-values people ask me to make one of those gay pizzas, with their vegetables, and pineapples, shitake mushrooms, and macaroni. Just makes me sick that anyone would even consider this to be a real pizza." Cain's proposed Defense of Pizza Act would amend the U.S. Code to make explicit what, according to conservatives, has been understood under federal law for over 200 years--- that pizza is the legal union of a cheese and tomato sauce with traditional toppings such as sausage and pepperoni. DOPA explicitly says that any other toppings or pizza design would be considered under the DOPA law to be "opposite-lifestyle toppings" which inhibit the moral fabric of traditional dining in America. "All I am saying is give pizza a chance!" Defended Cain. " If we don't pass DOPA, I can just imagine there’s no pizza in its most traditional form in the uncertain future of this beautiful country." Some Republican insiders are hinting at an attempt to amend the Constitution to clarify what a traditional Pizza is. 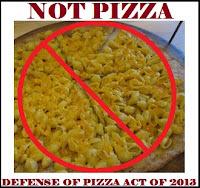 Critics of the potentially unconstitutional proposal, such as the Pizza Rights Campaign, have found Cain's proposal to be offensive, unprecedented and discriminatory to diners of non-traditional pizza toppings---Pineapple, Red Onion, and Macaroni--- commonly known as "PROM" toppings. Cain's law will also put an end to pizza bagels, deep dish Chicago-style pizza, and matzah pizza.